Providing you the best range of 935 universal thin-set adhesive and stone adhesive with effective & timely delivery. A multipurpose 935 Universal Thin-Set Adhesive for interior and exterior installation of ceramic tiles stone quarry tiles glass mosaic tiles pavers and bricks. HYDROCRETE 935 multipurpose thin-set adhesive is designed to mix with water and has a convenient open time with high adhesion & workability HYDROCRETE 935 multipurpose thin-set adhesive is compliant with Enand ANSI standards. We are the one of notable manufacturer and supplier of high quality Stone Adhesives. The offered adhesives are formulated using supreme quality chemical compounds keeping in mind the set industry standards. 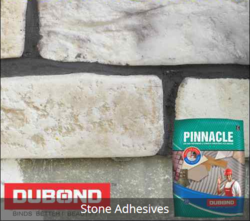 These adhesives are perfect for bonding and repairing bricks, concrete stones, tiles and wooden floors.Dubond’s Pinnacle is a high- tech single part adhesive with superior levels of adhesion and deformability. It is high performance dry set adhesive for use with water or latex for installing ceramic tiles, marbles, stone , any kind of porous and vitreous tiles or synthetic stone. It has a special function that works specially to counter conditions such as external pressures on cladding tiles of the skyscrapers and large format tiles with over laying on existing floors.